A professor once told me that if he got a resume with any kind of color on it whatsoever, he threw it straight in the trash; no questions about it. Employers assume when they see color on a resume, that the resume isn't strong enough to stand on its on and needs gimmicks to catch their attention. So keep it black and white, if you don't want to chance your resume ending up in the trash without even getting a once over. No books! Just the absolute basics (Contact Information, Objectives, Qualifications, Accomplishments, Educations, Certificates, Experience, Extracurricular Activities, etc). No need to give them your whole life story, and to be quite honest, you probably don't even need a cover letter unless it's for a really high-end job. With so many people looking these days, its hard to say that employers are wasting time reading a lengthy cover letters when searching. 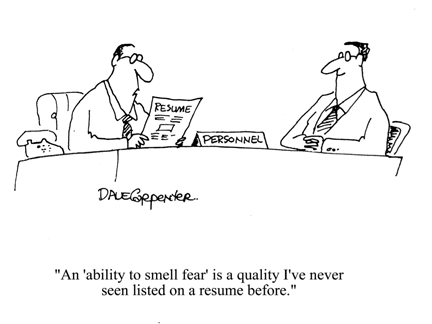 How many applicants do you think are "hard working" on their resume? All of them! You've got to stand out in the crowd by taking something like "cashier" and turning it into "financial business transaction facilitator". Not only does it make your mundane job seem more important, but it also shows creativity and smarts on your part which the employers will notice. Before you even think about sending your resume to a business, you should first research what it is they specifically need. Let me put it in terms that may be closer to your mind set. Just as you wouldn't send Lady GaGa to play a show at a rest home for retirees, you don't send a resume showing off all your extensive computer programming skills to a run-of-the-mill construction job. Give the employer a reason to hire you. What makes you original and stand out from the crowd? Everyone is good at something, so make sure you harp on the skill sets that only you bring to the table. Use almost only experience that can be made relevant to your employer, if possible. You may have experience on a farm herding sheep, but that shows very little on how well you can set up a web server. Unless you can make it relevant in some way, it's usually best to leave it out.